The list of drivers below is being updated regularly and does not have all drivers listed, additions will be made as we get up to date photos and info. 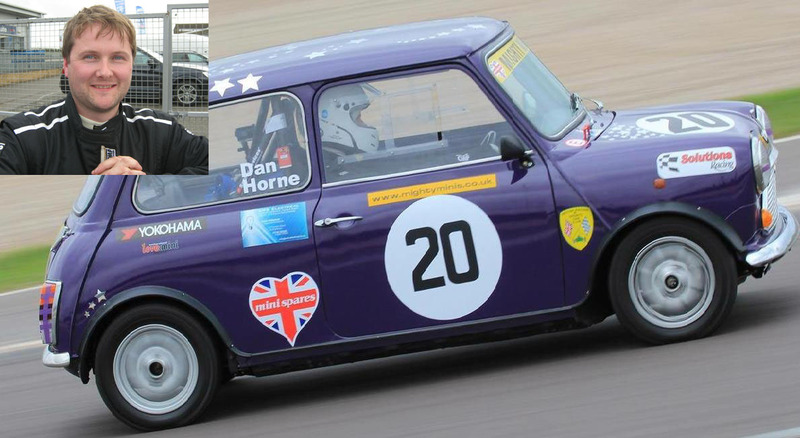 Stuart Coomb: Stuart has campaigned in his Maniflow Exhaust supported car at the sharp end of the championship for a number of years. Stuart was second in the penultimate race of 2015, and was on for a Class ‘A’ championship win and he very nearly did just that. However a last bend coming together landed him in the gravel trap putting an eleventh hour end to his efforts. A bitter pill to swallow, but as ever Stuart was the consummate gentleman. Stuart finished third in the championship and was awarded the prestigious ‘Leukaemia spirit of event award’ Stuart’s wife and daughter are present at every race supporting his efforts. Stuart did it again missing out on a championship title, Stuart finished second in 2017 season after having a mid season crash that saw him having to re-shell his car. 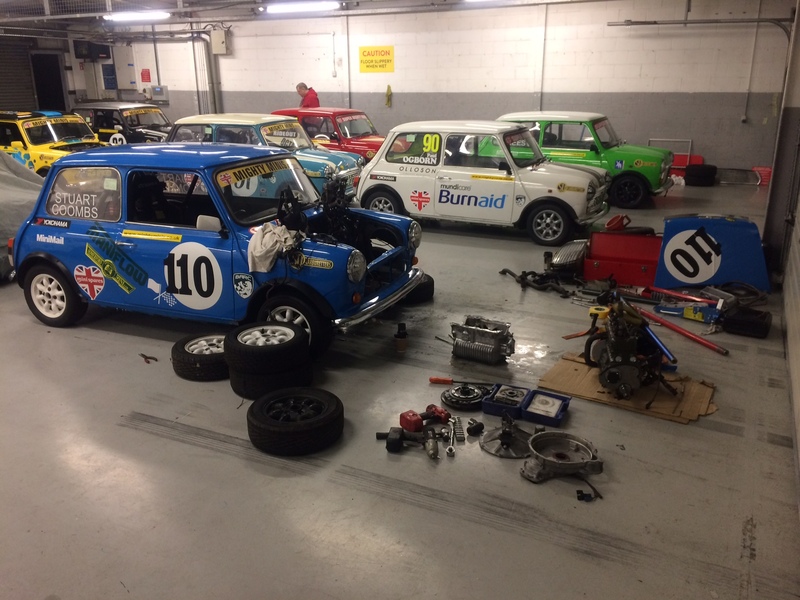 Stuart had a frantic start to the season after last years gearbox problems reared their ugly head again. I decision to pop the engine out and try to get to the bottom of the problem showed that a selector fork not being renewed during en engine rebuild was the culprit. Many phone calls and a determination to even drive hundreds of miles to get a replacement was met by a very kind gesture. Damien Harrington lent Stuart his s pare engine and gearbox for the two races the next day. This saved Stuart valuable time and stress not to mention the late night. This gesture by Damien should not be taken lightly as over the past few year they have been great rivals on track and Stuart beat Damien to the second spot in the 2017 title battle. 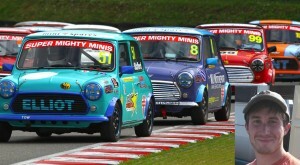 Such is the camaraderie between the drivers in the Mighty Minis championship. Regardless of this Stuart put two superb fight to finish on the podium. Finishing a credible third and gaining the fastest lap. Stuart went on thebetter that with a second and another fastest lap. Will Damien rue the gesture by the end of the year? 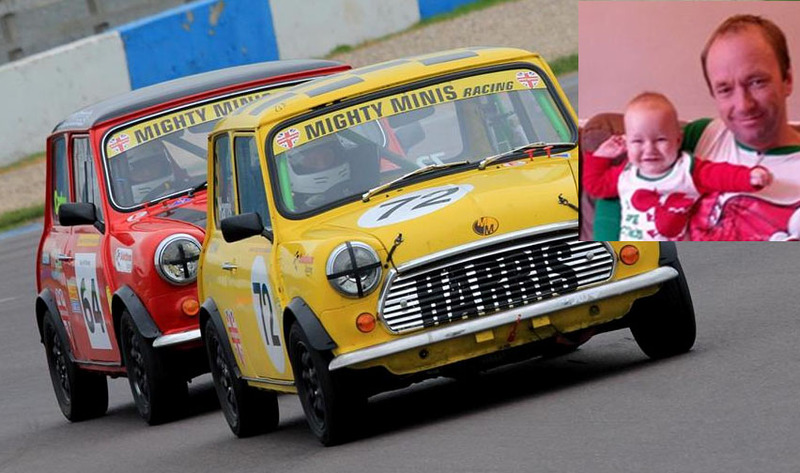 Lee Poolman: This will be Lee’s second year in the Mighty Minis class. 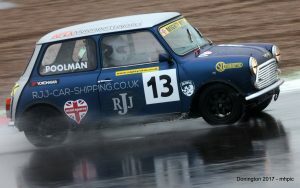 Lee had everyone on the ropes with a stunning drive in the wet at Donington Park and registered his first win. He will be competing in the whole season in 2018 and is hoping for good results! 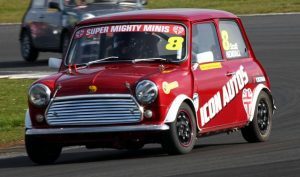 Lee built his mini in his spare time at home near Colchester Essex whilst running his own Car Transport and Storage Business www.apexcartransportandstorage.com Lee has started this season off with serious intent on the championship title if he keep up at this rate. Lee saw himself on pole after a wet qualifying, the sort of conditions we have seen Lee revel in last year. Lee went on the convert the pole position start to a race win after the tremendous mid race battle. Top to his weekend off he went on to win the second race. He has maximised his points hall and is standing on the top of the points table. 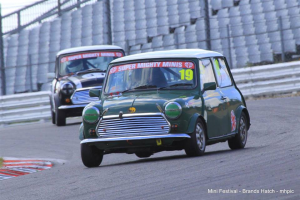 Mick Grover: This is Mick’s third year in Mighty Minis and he is certainly finding it much more enjoyable and cheaper than the Karting he has done in the past. A coming together at Silverstone last year, no fault of his own, lost him a few races as he straightened the car. Mick is having a bumpy ride so far this season as he dusts of the winter cobwebs. His car is most noticeable with the GROVER motorsport logos that emblazon the car. 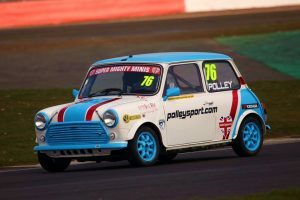 Craig Pendlebury: This is Craig’s fouth season in the Mighty Minis class a championship and he is certainly viewd as one of the front runners, fortified by podium finishes and race lap leads so far this season. Graig’s partner and mother are in regular attendance at every race lending a hand and offering support where possible. It wont be long before we see him on the top step. Dan Horne: One of the competitors from the north of England 36 year old Dan and his friends painstakingly built his car and is a well respected driver in the championship who is finding his feet. 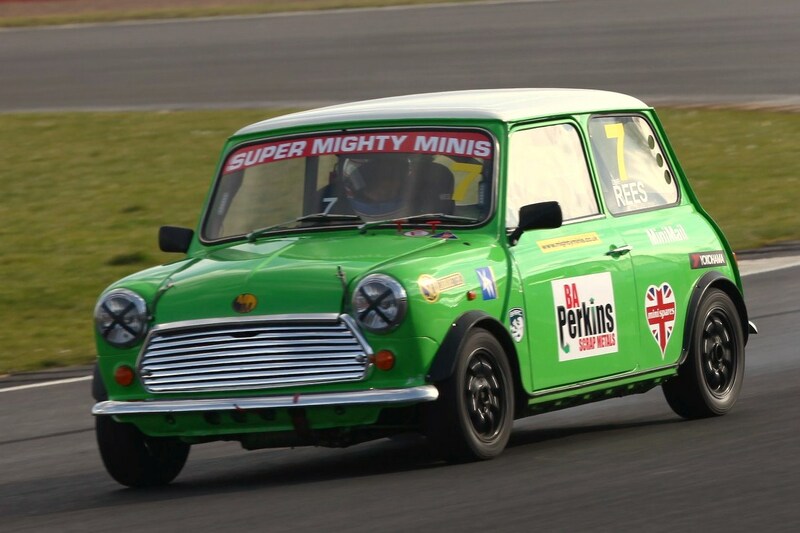 This is his thrid year with the Mighty Minis championship having never raced before. Dan certainly enjoys his time at the circuits and is a quiet but determined driver. He always wears a smile as do his friends. Great man to have in the championship. 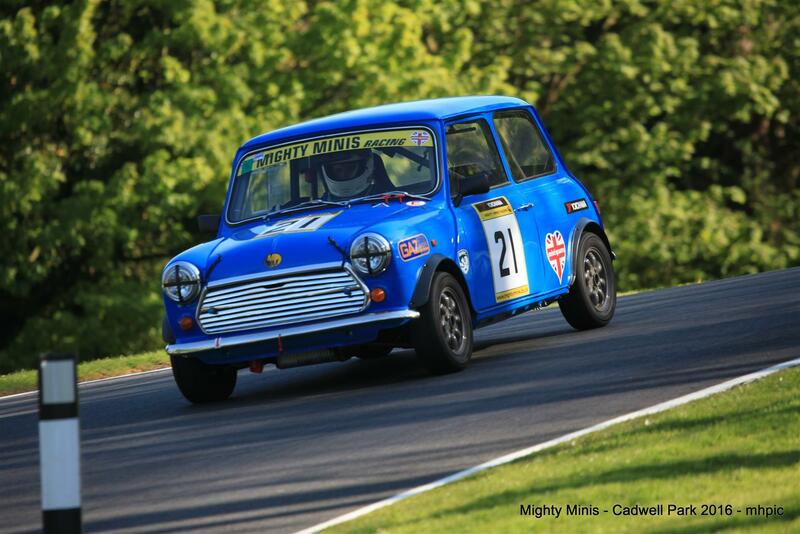 Robert Threfall: Rob Threfal new to Mighty Minis racing this year is having a wail of a time. Rob confesses that in all of the cars that he has competed in the Mini offers the best experience that he has had. He defers to his lovely partner with a cheeky mention of her on his front wings. Great guy and a big plus to the championship. 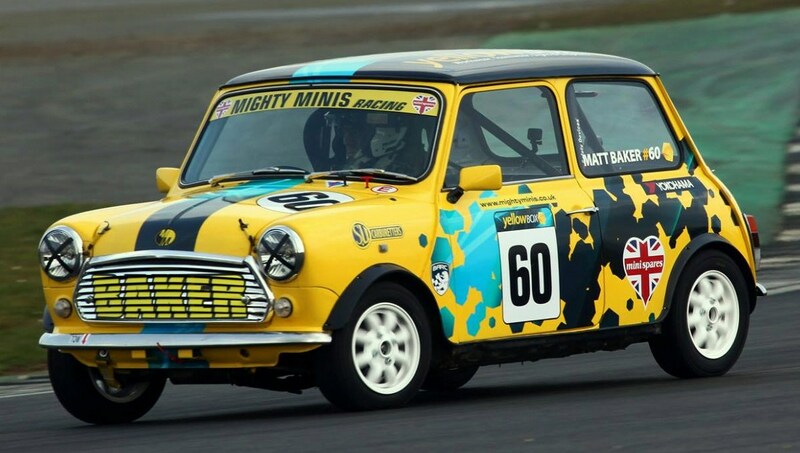 Daniel Heywood: Dan works with a historic motorsport race preparation business and started racing in the Mighty Minis championship in 2017 and has had varying success. He ended his 2017 campaign with a race win at Pembrey circuit in South Wales and in doing so put down a marker as to for serious intent for the 2018 season. Silverstone was a case of mixed blessings as he shook off the winter cobwebs. Dan qualified second for the first race. 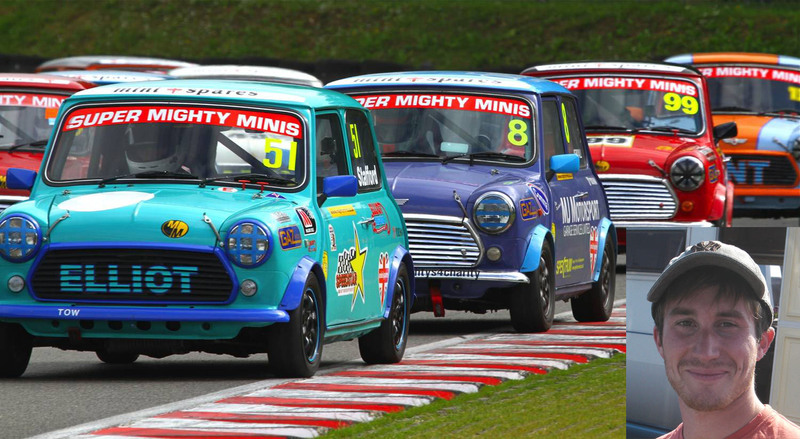 However a tangle with a Super Mighty Mini under braking saw him only be able to finish fourth, which was still a great result all things considered. He drove like a man possessed in the second race and but only managed seventh. However it was not a bad points haul for the first race of the season and it is apparent that his running form will see him compete at the front this season. 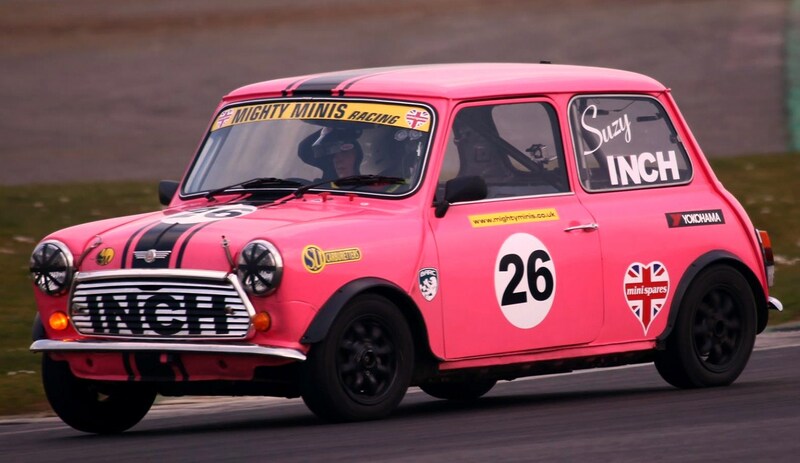 Suzy Inch; This will be Suzy Inch’s second season in the Mighty Mins class A championship furthering the long history of the Inch family participants in Mini racing. Last year competed in her multi-coloured car number 74 however this year she is sporting her inch Team colours PINK she has also chosen to run as number 26. Suzy had a great start the season at Silverstone and it was quite obvious that she has improved her race craft and generally got stuck in. Suzy finished seventh in the first race bettering her qualifying result but slipped back in the second race finishing tenth. Suzy had some great battles during in the two races including with her team mate Greg Daw. Laura Harris: Laura joined the championship four years ago after some years as an avid supporter. With the help of her good friend Andy Harrison of AceSpeed, thrity four year old Laura has managed to be competitive as she gains skill and confidence. Laura works at Moss Bradford and is a keen classic car enthusiast. We see Laura improving year on year as she gets to grips with the challenge. Laura did not have the end to her 2017 season that she would have liked as she totaled her car in a blameless incident at Pambrey the last event of the season. Laura is working flat out to get the funds together as she is rebuilding her car and hopes to be back out soon. She is keen to mention the well need help by Acespeed and Moss Europe. Laura was presented with the Neil Fearnley commitment award, as she trailers the car to all of the meetings on her own and works on the car on her own between races. If you can help she has set up a gofund page- www.gofundme.com/rebuilding-mighty-mini-30. Please share. Remember every little helps, it can soon add up with your help. Be part of a success story. 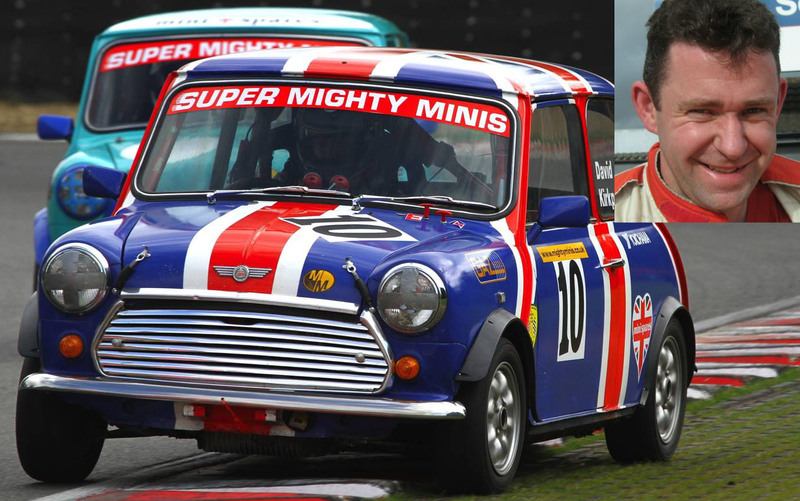 Nick Lyford: Nick represents the driver that Mighty Minis was designed for, in that he always considered getting involved but never found the time or the right championship to take part in. Nick took the plunge after years of supporting his son James who graduated from Karting. Nick who works in the oil industry was able to arrange his diary to suit his ambitions as a race car driver and has not looked back since. Nick has owned many minis in his life, so this was the opportunity to put those country lane white knuckle rides to the test. He is a regular top ten finisher narrowly missing out on the podium. Nick also competes in twenty four hour races now as well. Nick’s wife and family are always in attendance to offer support and hot cups of tea when needed. 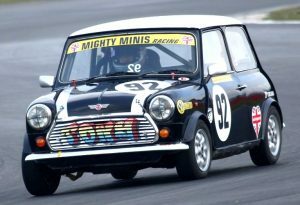 Darren Nightingale: Darren is better known as Daz and has raced in the Mighty Minis Class ’A’ for five years. 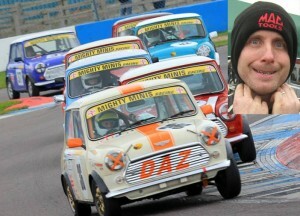 Forty three year old Daz owns his own garage and also maintains other cars in the championship. Daz has had his misfortunes over the years and now competes in his second car. Daz’s wife and two young children come along to support him at all races. 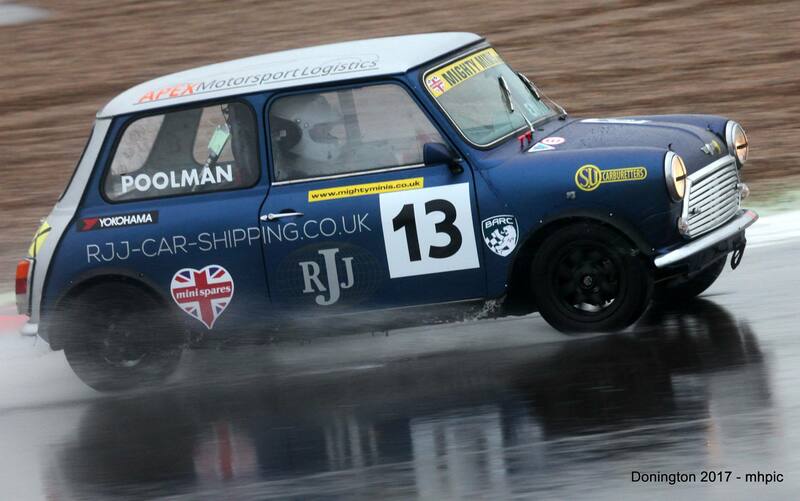 Jim Carolan: This is Jim’s second year of competing in the Mighty Minis championship. He has competed in many disciplines in his time including Rally Cross. Jim has also taken part in the Mazda MX5 championship and the BMW Compact cup championship. A man that can always be found with a smile on his face and an intelligent conversation to be had. 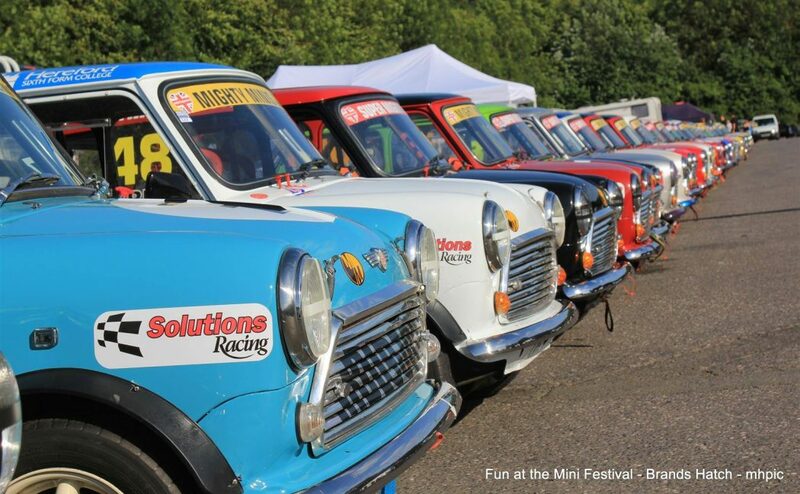 Mark Davies; What did Mark have to say after his first race weekend in the Mighty Minis championship ‘ The marvelous Mighty Mini racing team, named my daughter, Luna (3), was formed in 2017, after a 32 year break! 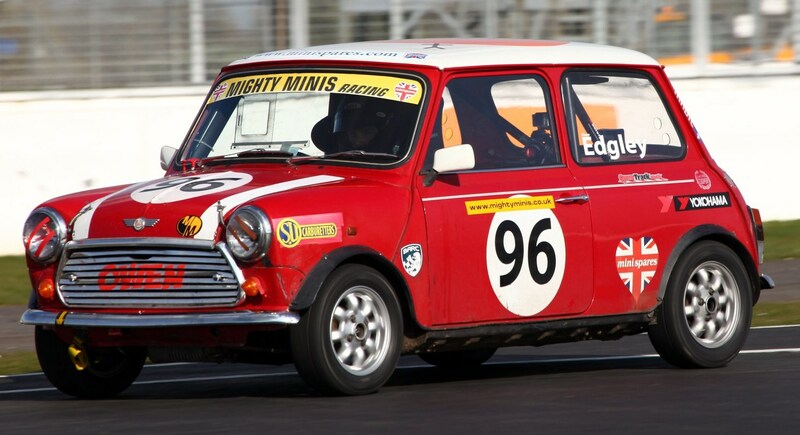 (that’s the last time I raced in a Mini then, without an ECU though). Being the oldest novice in this year at the moment has an interesting twist in as much as I hope to show some of the youngsters how to drive, but that might be just in my head! We’ll see! The first few pre- race meetings and the first race meeting at Silverstone have shown me how close the racing is and how close the community is behind it is. EVERYONE helps everyone else. Just how it should be. Stuart Coomb suffered a failing gearbox in qualifying and it was only matter of time and the rumour of Stuart buying the beers that the engine was quickly on the floor, ably assisted by, yes you guessed it, Matt Davies who was returning to motorsport after an absence of some 35 years. 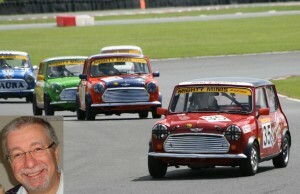 Great to know that Mighty Minis racing was the championship that caught his eye. Matt finished eleventh and twelfth in the two races. 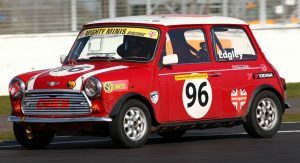 However, at the first race at Silverstone he was asked if he wanted to weigh in the Mini, he replied ” do I have to?” What is the advantage? he asked Indignantly. ” People usually do” was the answer. 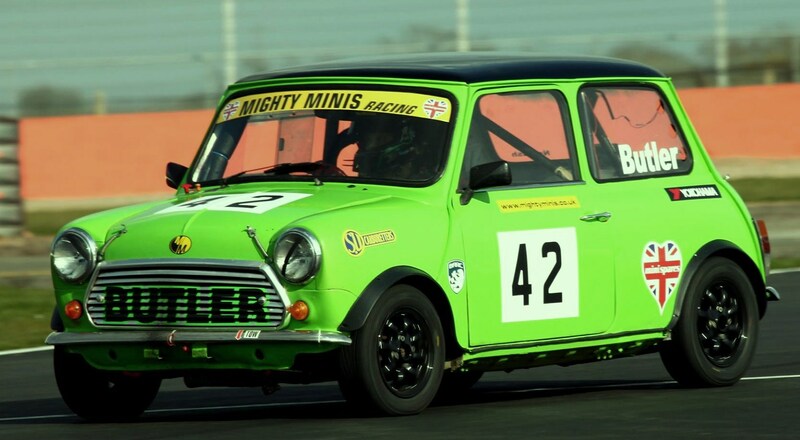 Ben Butler: Ben has competed in both the Mighty Minis and the super Mighty Minis in the past and has returned for some more fun having competed in another Mini championship where he aquaitted himdself well finishing second. Ben has returned with a view to enjoy himself with the Mighty Minis gang, and did quite well even though he initially struggled to adjust to driving a Mighty Mini. Ben Qualified sixth but went on to improve in the first race with a well deserved second continuing to finish third in the second race. a good points haul. Ben left Silverstone third in the championship. Peter Vempl y Burwood: Peter ‘s story is somewhat different As he had raced with us for a couple of races in 2003. Peter built his car back then and sold it regretfully, as his personal circumstances had changed. 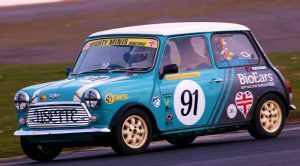 However he had not put his burning desire to compete in the Mighty Minis championship to bed and had always felt that he had unfinished business. He contacted us last year to see if we knew who had his car and thankfully we were able to help. He has since checked the car over and got the seat where he needed it as he is a tall lad. 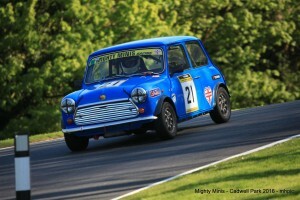 Brands Hatch was always going to be his first outing this season and he met his self imposed dead line. Damien Harrington: Damien has competed in the class ‘A’ championship for some years seeing him finishing third in the championship in the past. 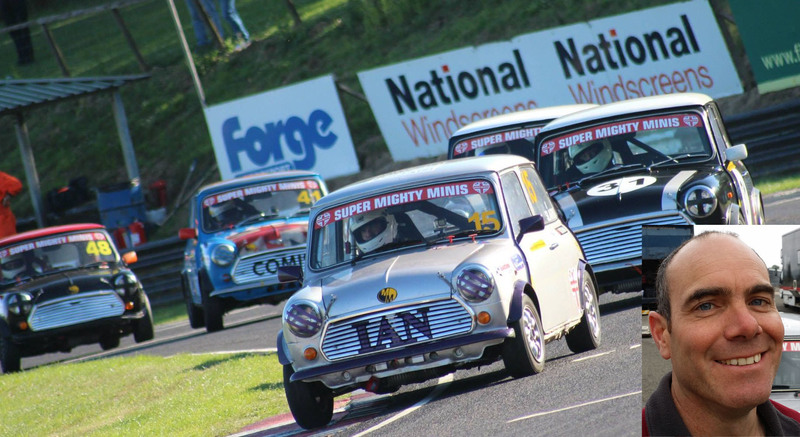 Damien has had a brief foray in the Super Mighty Minis, but has felt there was unfinished business in the Class A Mighty Minis. Damien started his 2018 campaign qualifying third having him start on the second row of the grid whilst his arched rival Stuart Coomb floundered in thirteenth. Damien stepped up to the mark when he heard that Stuart Coombe was in trouble and lent his his spare engine for the two race the next day. But will Damien rue the splendid gesture later on in the championship battle. But it is a genuine reminder of the type of camaraderie there the championship. It going to be glove off this season and the scene is a set for a great battle. Damien ran out of fuel in the first race and due to a mix up in the pit lane whilst he tried to get going again he had to pay a visit to the clerk of the course where the due waving of arms was metered out. Damien again had problems in the second race as he had a water hose come loose in the holding area. A frantic rush by everyone saw him start a the end of the pit lane. Damien went on to close the gap to finish a credible fifth. Mathew Baker: Matt is involved with the country wide yellow box company, this will be Matt’s first season in the Class ‘A’ championship Matt qualified eleventh, but he bettered that in the first race finishing eighth but dropped down to eleventh in the second race. Greg Daw: This will be Greg Daw’s first season in the Class ‘A’ Mighty Minis championship, Greg is a Plymouth based Garage owner (PGS) , his partner is the very well accomplished mini racer Louise Inch. Greg qualified seventh and beat that in the first race finishing only marginally better with sixth, however the second race he did not fare as well and finished eighth. we are sure we will see Greg improve as the season unfolds. Morgan Harris: Morgan has raced in the championship for four years in his bright yellow car and has progressed year on year. Forty something year old operations manager along with his wife and young child enjoy the atmosphere both on and off of the circuit. Morgan took part in the 2016 annual charity ride event at Castle Combe circuit raising much need funds for two great charities. Dan Bury: Dan is a JCB engineer by trade and is more accustomed to fast rear wheel drive Go Karts.but has defended his honour well in the last couple of years. Dan qualified tenth and went on to better that with a fifth in the first race and almost made it to the podium finishing fourth,. Could there be a win in the pipeline? Lisette Jane Osborn: Lisette has been a loyal supporter of her husband Paul who has raced with the Octane racing team for a few years. Lisette joined the grid in 2017 to mixed fortunes. However this year she will compete in Paul’s Mighty Mini as Paul will be racing a Super Mighty Mini. Lisette took it easy in qualifying as she is not very confident in the wet just yet. She qualified twelfth and finished ninth in the first race but slipped back to thirteenth in the second race, a good points haul for the first two races and certainly a boost to her confidence. 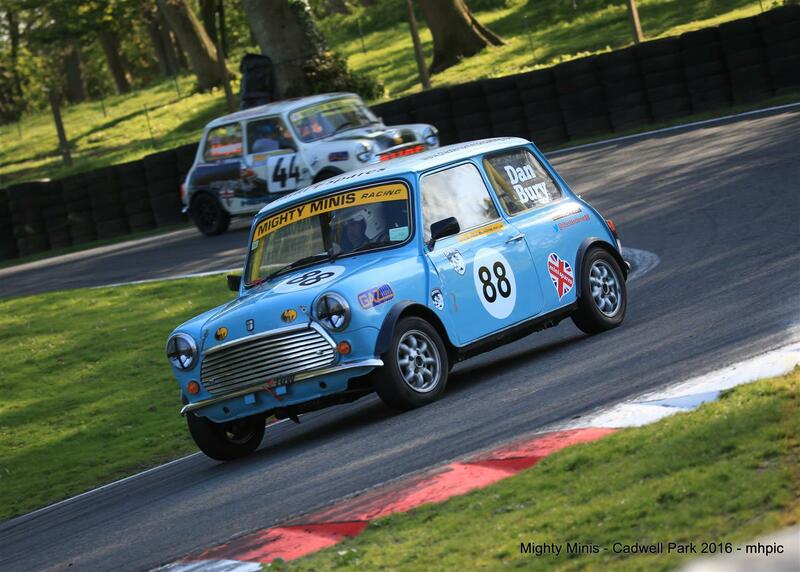 Tony Claringbold: This will be Tony’s second year competing in the Mighty Minis class A championship. 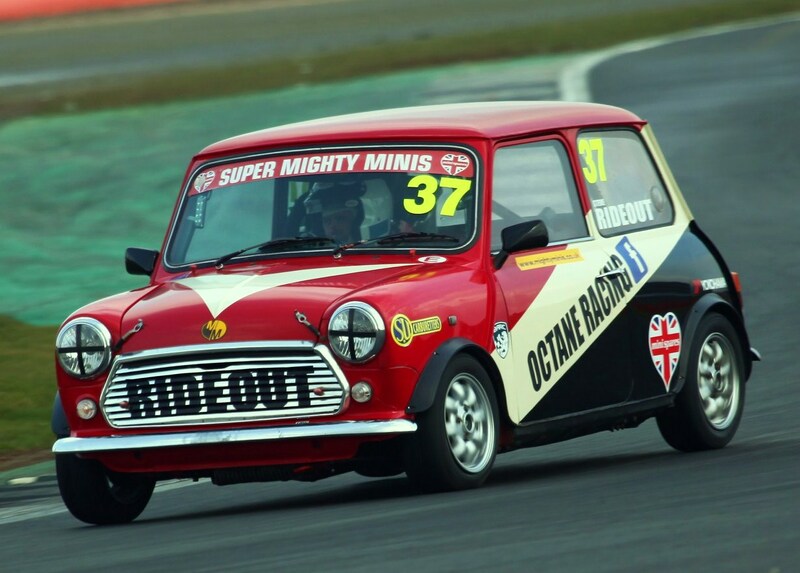 Tony dipped his toes into Mighty Minis racing in the 2017 season sharing a car with Lisette Ogborn. Previously he had been Sprinting and Hill climbing a variety of vehicles with varying degrees of success. After a few MM races he was hooked and now owns his own car and aims to compete a full season in 2018 thanks to Steve Rideout’s support in the shape of Octane Racing who prep and fix the car for him. 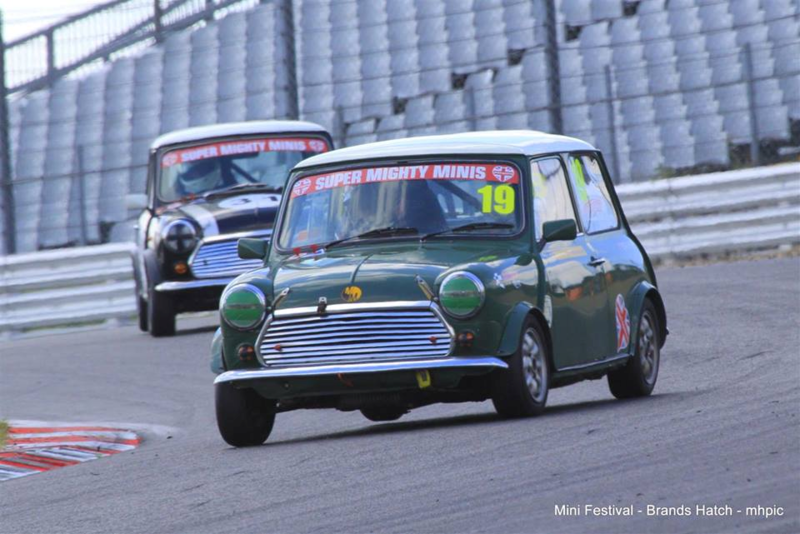 He admits that Minis handle unlike anything else he has raced so there is always something to learn but it’s a lot of fun along the way! 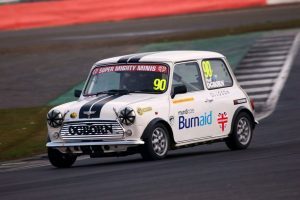 Owen Edgley: this will be Owen’s second year in the Mighty Minis class ‘A’ championship and has shown well last year, he had been dogged by electrical faults but fared well with two well deserved podium finishes. Owen also won the 2017 Novice championship. 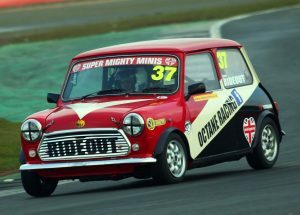 At Silverstone we saw Owen suffer another DNF caused by a ill fitted reluctor ring. as ever everyone lent a hand and it was Mick Grover who identified the problem. After a frantic effort against the clock, Owen was able to get out for the second race and finished ninth after starting at the back of the grid. 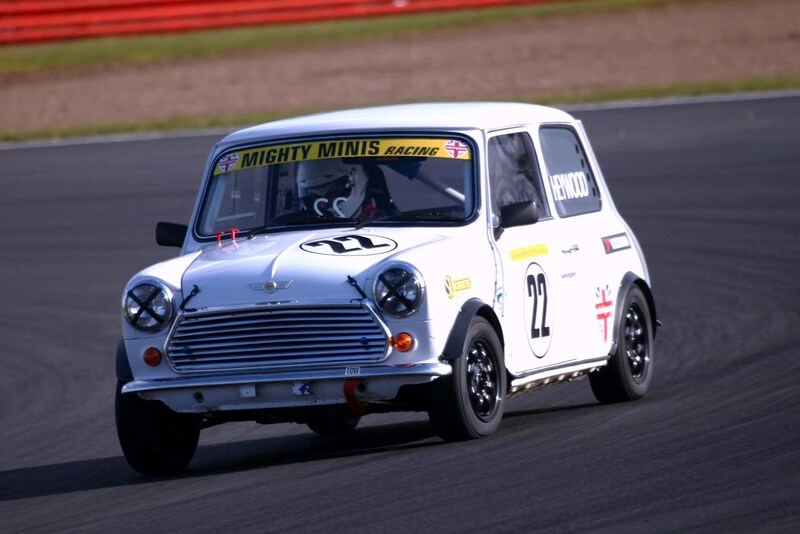 Nick Townend: This will be Nick’s first season in the Mighty Minis championship after growing up near Silverstone and flirting with motorsport throughout his life, his work in the Media industry and slight obsession with classic Mini’s got the better of him. 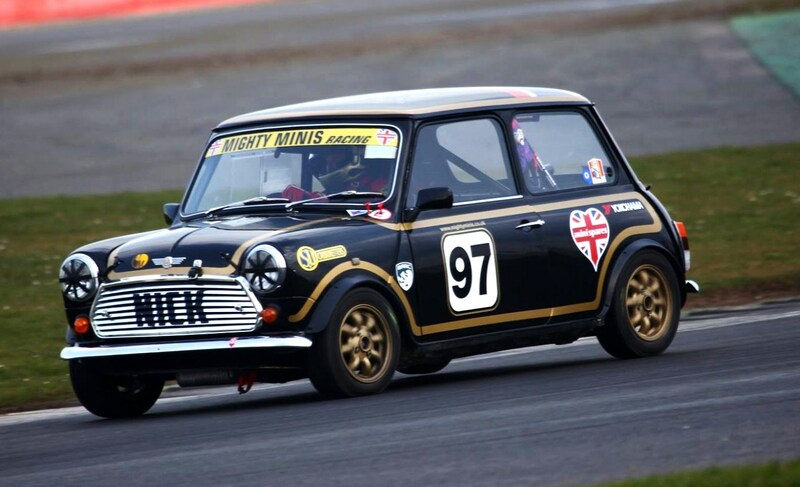 After collecting his rusty wreck from Glasgow, lots of welding @thechilimotospeedshop, scouring eBay for parts and with some race know how from Andy Harrison at ACE speed he is looking forward to taking his bow at Silverstone 2018 in the lotus inspired black and gold #97 car. he will be travelling to the races from his home in Yorkshire with his partner and baby boy and god willing their vintage VW camper “daisy” and will be roping in various family members to crew the car throughout the season. Nick is exactly the sort of driver that this championship is aimed at. It will be a joy to see his journey improving race by race. 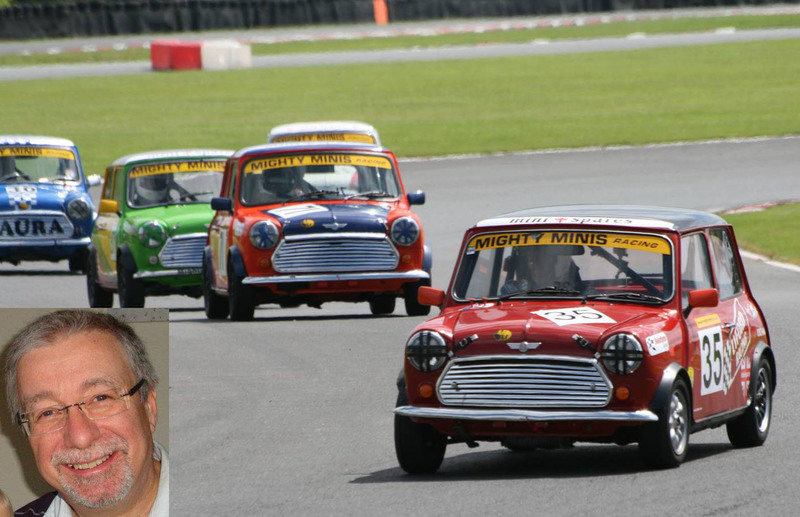 David Bernie: David started his racing in the Standard Mighty Minis with varying levels of success. 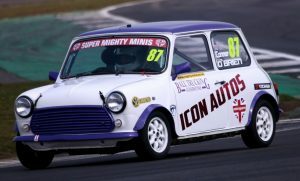 However he found that his desire to compete in the Super Mighty Minis got the better of him and he sold his Class ‘A’ car and graduated to the Super Mighty Minis some years ago. He now has a young family and manages to get some racing in between his work in the financial sector and his family responsibilities. He is a seasoned front runner and is always very exciting to watch doing battle. His father, has the honour of spanner duty and does a very fine job ensuring the reliability and performance of the car is second to none. Dave Rees: Da ve started his racing in the Standard Mighty Minis and established himself as a regular front runner. 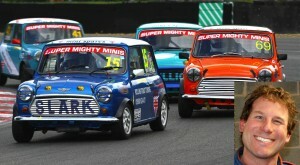 However the draw of more power saw him step up to the Super Mighty Minis. The last few months have been a bit sketchy for Dave as he has not been in the best of health. This year he anticipates that he will be back out having some fun. Dave will be returning for another year of hectic racing and he was narrowly beaten to a podium finish in the first race. He qualified fifth and although the first race result was great by any standard he then finished fifth in the second race, leaving Silverstone with a healthy points haul. Scott Kendall: Thirty nine year old Scott is a true representation of what this championship stands for, in its efforts to make motorsport more inclusive. 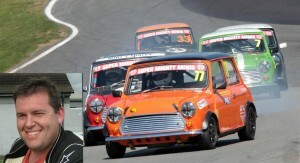 Scott started racing when he was eleven in the Mini Stox and at sixteen raced in stockrods. Scott has shown himself to be a very talented driver who struggles to find the budget for every race he takes part in, but manages to just make it to the end of the season, normally with many borrowed parts on his car. 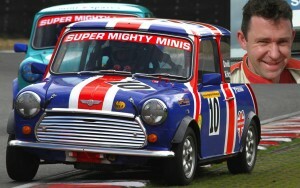 A feisty driver who will battle until the flag drops won the Super Mighty Minis title in 2010. His wife Milly and the children really enjoy coming to see him race and support him at the events. 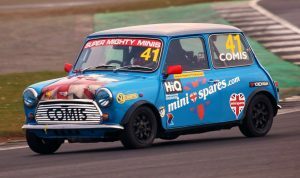 Scott won the 2017 Super Mighty Minis championship after a year long battle with Adrian Tuckley. Scott was out performed in qualifying and only finished seventh, however it was notlong before his race craft saw him battling at the front. He is magic on the brakes. However in the race himself and Greg Jenkins and himself locked horns on th erun up to the line only to both be outsmarted by lady driver Jo Polley. Scott finished third. putting him at the top of the leader board but by only two points. 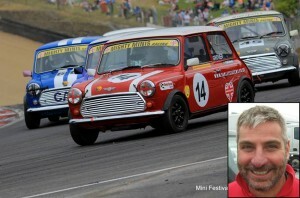 David Kirkp atrick: David works in the banking sector and certainly enjoys his Mini racing. David is probably our tallest driver, but this does not hamper him. 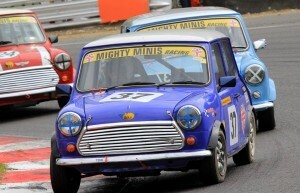 He started racing in the standard Mighty Minis and has since moved up to the Super Mighty Minis. 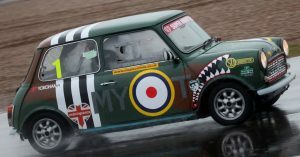 His very recognisable union jack liveried car is regularly seen at the front of the grid battling relentlessly. David suffered with failed clutch, which was huge shame as he was in contention for a good finish if not a race win. 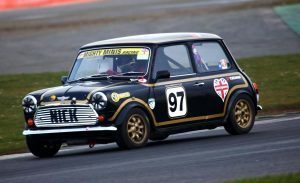 Neven Kirkpatrick: Neven Kirkpatrick has won both the Standard Mighty Minis and the Super Mighty Mini championship in the past. Neven is now not only in-charge of his trusty stead but has a young family to take care of. His Demand Technology sponsored car is always at the sharp end of the race. Neven has certainly owned the name of a hard charger who will take advantage of any mistake race determinedly to the flag. Neven qualified ninth and was seen to better that in the first race finishing in second spot however after a hectic second race he stayed out of trouble and finished fourth, and was in contention for a podium. Ian Slark: Ian a Classic car restorer by trade follows in his brother’s and father’s footsteps as a keen Mini racer. At forty two, Ian has competed in the championship for six years and won his first race in his ‘Number Works Pubs’ supported car in 2014. Ian then went on to win a closely fought Class ‘A’ championship entering the last race one point ahead of his nearest rival. As the Class ‘A’ champion he moved across to the Super Mighty Minis for the 2015 season, finishing a credible third in his first seasons’ campaign. In race one we saw Ian Slark finish on the podium on his return, it did look like he was going to pick up where left off. However lady lucky was not on his side when he took to the grass under braking at the end of the Wellington straight in an effort to avoid the back of a slowing Dave Rees, he lost control. Ian impacted the barrier quite hard doing fair a bit of damage to the front of the car. Ian was fine apart from a pulled muscle. 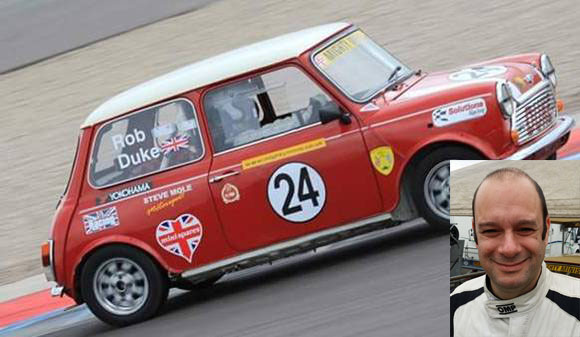 Neil Slark: Neil Slark has motorsport running through his veins as his father Brian was the founder of the family business ‘ Slark race engineering’ which Neil now owns. Neil is responsible for most of the tuning work on the cars in the championship through his rolling road business. Neil has won the Mighty Minis championship in the past and now competes in the Super Mighty Minis and shares a car in Classic Mini racing. His wife and young family come along to all of the races. Mark Ditchburn: Mark a Plasterer by trade, but also a very funny writer as witnessed on his extremely funny satirical Facebook page, started racing in the Mighty Minis class. Mark is a staunch supporter of Mighty Minis racing, recognising that without this championship he would never have had the chance to compete in circuit racing. Mark builds every aspect of his car and thoroughly enjoys seeing how well it fares against other cars. His son, daughter and wife support him at all of the events. 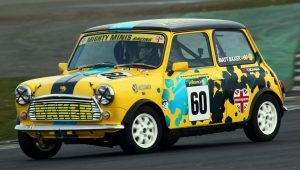 Mark ‘Biggles‘ Burnett: Thirty something old Mark, the MD of the SU Carburetors Company has competed in both categories of the championship and can be seen also in his Historic Racing Mini. Mark and his wife Rosie have two young children who are enthusiastic in all things mechanical. Mark is a determined but fair racer and has a great sense of humour. His car’s distinct livery represents his interest in classic aviation. Steve Dawson: Steve works in the motor trade in his father’s business. 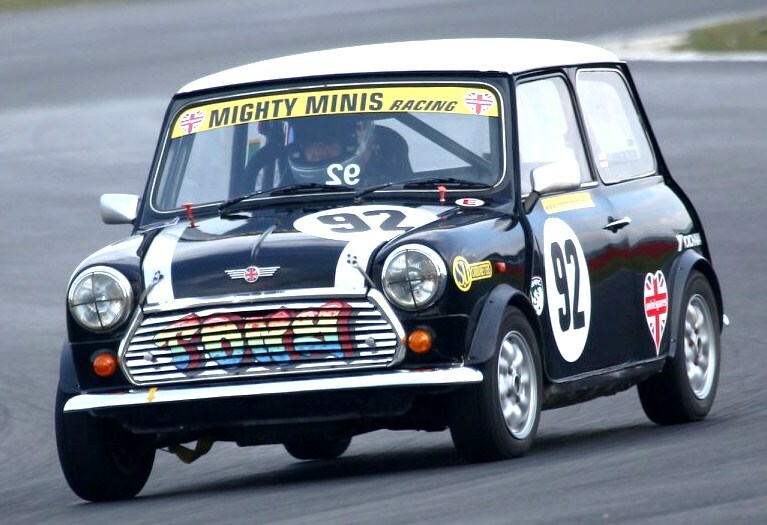 Steve was one of the drivers who took part in the first season of Mighty Minis racing in 1996 and has won both the Standard Mighty Minis class and the Super Mighty Minis championship. 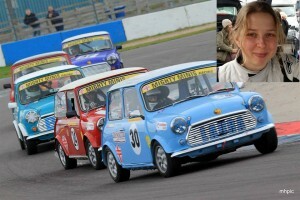 Steve is affectionately known as ‘Awesome Dawson’ Steve’s sister Melanie also raced in the Mighty Minis championship. Steve has had a sabbatical over the years and has returned with winning at the forefront of his mind. 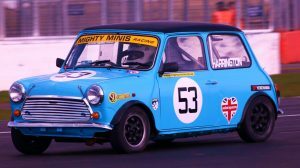 He has managed a third in his first race in the 2017 season..
Steve Rideout: 2015 Class ‘A’ champion, Steve joined the championship four years ago to achieve a personal ambition to race a Mini. Steve had looked at other options and realised he could never afford to be a front runner in those. 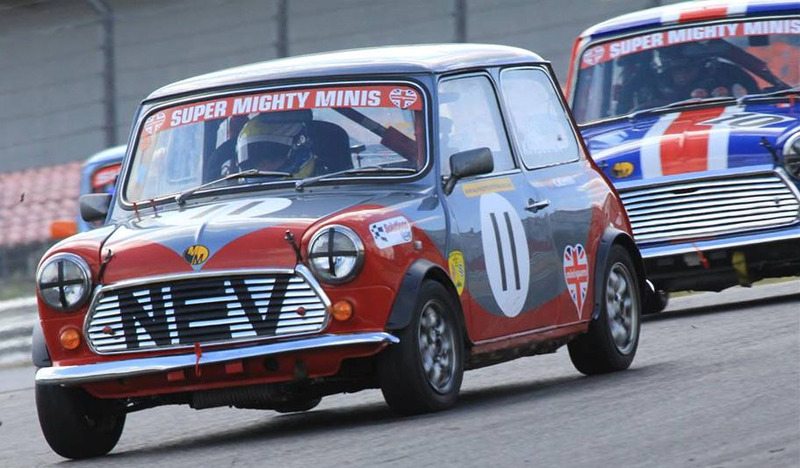 Steve had a brief foray in the Super Mighty Minis in 2014 but felt that he had unfinished business in the Class ‘A’ category so finished off the season by returning the Class ‘A’ grid. His race season had not started off on the good foot, as a down on power engine hampered his efforts in amassing good early points. However after finding a broken piston ring he was on winning form. He went into the last race expecting a championship second at best unless Stuart Combes suffered the commentators curse. On the last corner of the last lap, he got out of the way of an out of control car that crashed into Stuart, putting paid to Stuart’s title effort handing the title to Steve. As much as he is overjoyed to have won the title he does feel that Stuart was robbed, such as the gentleman he is and a very worthy 2015 Class ‘A’ champion. Steve credits his wife Lyn for her support for him to enjoy his hobby. Steve also looked after Josh Young’s car which won the 2015 Novice championship. Steve is now enjoying the new challenge of a Super Mighty Mini. Steve Rideout was the first casualty of the mixed grids as Dan Haywood unfortunately got sucked into a rookie mistake and tried to go with Steve but found that the braking ability of a super was far superior to his Mighty Mini, an easy mistake to make. Steve managed to get the steering fixed and was back out in the second race finishing eighth. Alex Comis: Alex has raced in both categories of the Mighty Minis championship since he joined in 2000. 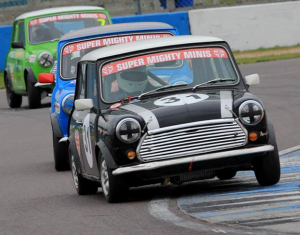 Alex won a hard fought Super Mighty Minis Donington night race and has been a regular visitor to the podium over the years. Thirty eight year old Alex works at Birmingham University as an Administrator. Alex is supported by the Mini Spares Centre. Alex was a past recipient of the Chris Inch Trophy. He looks after his car himself with the help of a few friends. Always up for a laugh and a true prankster, regardless of his fun character he is a winner at heart . Alex raced with a eye on consistency which paid off as he secured the third spot. Silverstone saw Alex testing various shock settings trying to optimise the set up of the car. Understandable as he could only manage to qualify sixth. Unfortunately he could not better that in the first race and ony managed eighth and in the second race only mangaed to inmrove slightly to seventh. 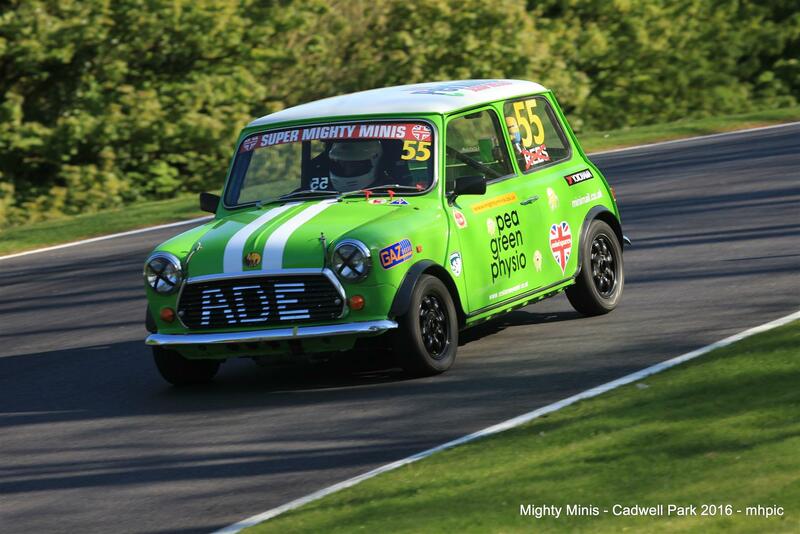 Adrian Tuckley: Adrian has competed predominantly in Class ‘A’ Mighty Minis and has decided to chance his hand this year in the Super Mighty Minis. It might have been a stunning decision as he left Donington Park as the championship leader by a mere 2 points after the fourth race of the season. Adrian took the fight to Scott Kendall and it went to the wire unfortunately a loose battery connection handed the championship to Scott. Dan Palmer: Dan owns SV synergy an audio visual specialist company that fits high end bespoke systems into luxury apartments and Yachts around the world. He tries to race as and when he can fit the time in. 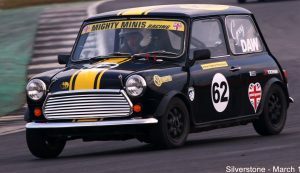 Dan started his racing in the standard Mighty Minis and is one of the many drivers who took the plunge and graduated to the Super Mighty Minis. A new addition to the family has put even more pressure on him and we hope to see him back out soon. John Cockburn-Evans: John started his racing fun relatively late, getting his licence at the age of 48 in 2009. After a disastrous first race where he was taken out by a spinning Elise in the MSVR Elise Trophy Endurance at Brands Hatch, he turned his attentions to other series, and tried to follow Martin Donnelly’s advice from the Elise Trophy which was “Drive Fast & Don’t Crash”, sage words, but not always easy. John had moderate progression in the BRSCC MX-5 Championship with a few podiums in 2014 and a few more in 2015, with a win at Croft in September. 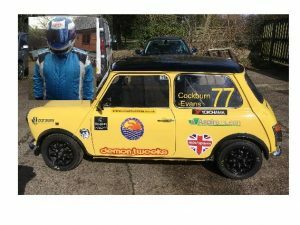 John decided to take sabbatical in 2016/7, in order to start a business , but is now prepared for, and looking forward for to the Super Mighty Minis 2018 competing in car 77. John takes his racing moderately serious, but very little else in life. He is happy to follow the mantra of Zen Dog, ”He knows not where he’s going, For the ocean will decide, It’s not the destination, It’s the glory of the ride”. John now resides in Bury St Edmunds Suffolk, but still considers himself a “Plastic Scouser” from Cheshire, and runs a successful business consultancy. John is married with two children, and although has already picked up the nickname “The Russian” from one of the other drivers, but would be happy with what his children call him “Blue Stig”. John spent most of his race weekend pumping the clutch pedal as though he was blowing up a truck tyre to no avail due to the loss of hydraulic pressure and had to settle into driving most of both races in fourth gear, much to his frustration. However he did get to play with his ultra-bling lights whilst battling through the Mighty Minis, so it’s not all bad. 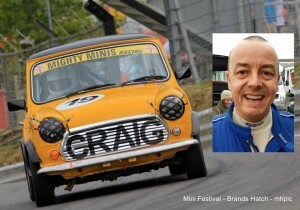 Greg Jenkins: Greg the owner of the Italian Job Mini hire and independent mechanic started his racing in his early years with Autograss. 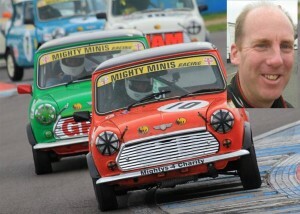 Thirty nine year old Greg as been with the Mighty Minis championship for some years . His first car ended its life after a driving error at Castle Combe. Greg is a well respected front runner, Greg and his father maintain his car which won the 2015 ‘Yokohama’best presented car award. Greg won the 2106 Mighty Class A championship after many years of trying. He was fully of praise for his father who has been a great help. 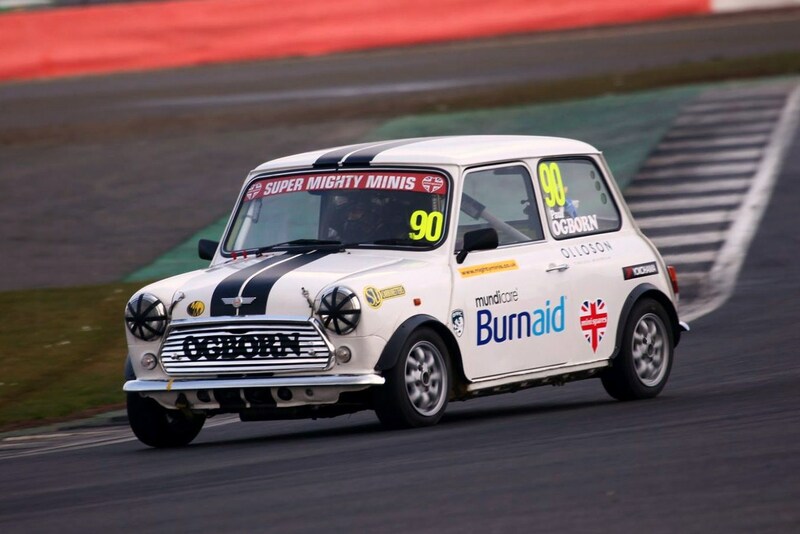 Greg now competes in the Super Mighty Minis championship supporting the Brain Tumour Charity through his efforts. Connor O’Brien: Connor join the Super Mighty Mins in 2017 and had a fun filled year as he got to grips with racing a Super Mighty Mini, he certainly kept Mark Jones form Icon Autos busy. 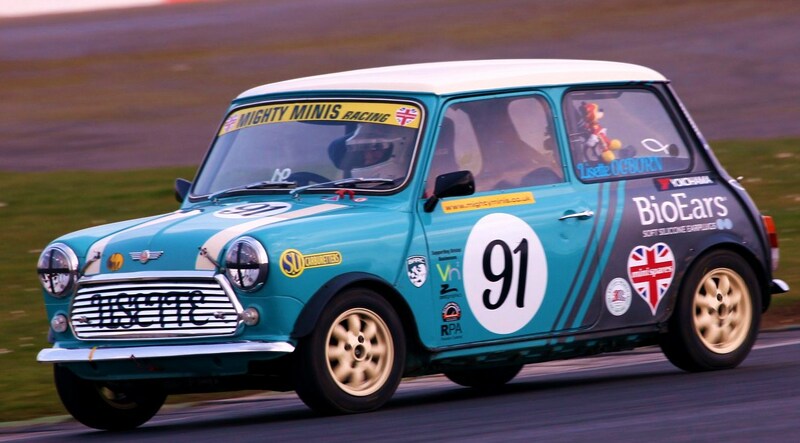 Connor was co founder along with Josh Young of the Agouti Motorsport team. 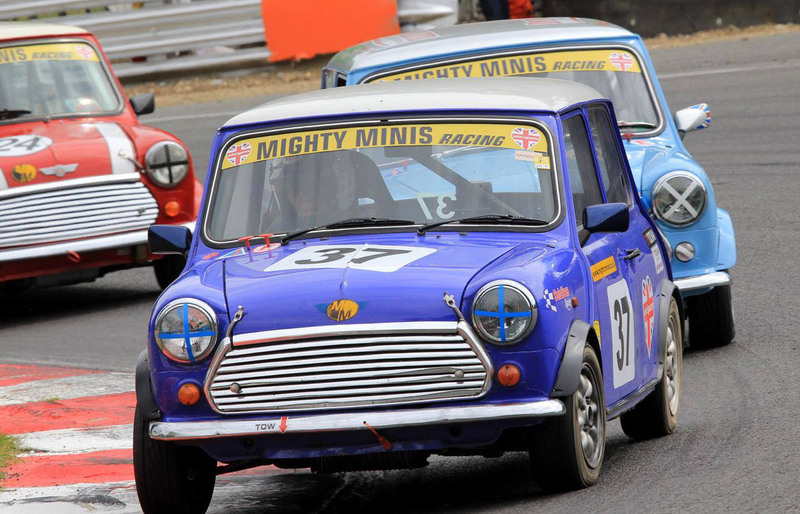 At the height the team had four drivers including Sarah Moore and eventual 2017 Mighty Minis championship winner Alice Hughes. 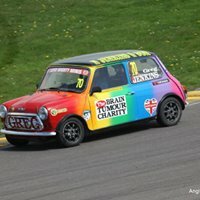 the Agouti Motorsport team promoted the ‘children’s air ambulance charity’. 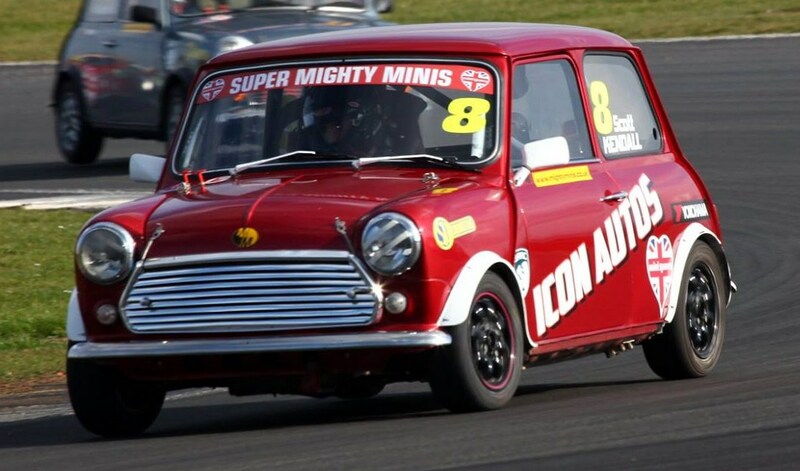 This year Connor will be racing the ex- Louise Inch Super Mighty Mini. We wish him well as his improvement is tangible. He is actively supported by his mother Rosa, his dad Dave, his uncle Alan Ball, and his grandfather along with his mischievous side kick/ drinking buddy Ken. A fantastic and fun family to be around. Connor won the 2017 most entertaining driver award, more to come this year. Connor put on the treat for the Ball Trucking race team, qualifying a brilliant third. This can only be seen as a fantastic step forward, social media had a meltdown. Paul Ogborn: Like many people, Paul had always wanted to compete in motorsport but with work, a hectic travel schedule and family commitments there never seemed the time. When he turned 50 he knew it was now or never and shortly after his 50th birthday he made the move and took his ARDS test at Silverstone. A few weeks later, after a few phone calls, he chose Mighty Minis as it offered the best opportunity to get started and everyone loves Minis. Within a month of taking his ARDS he had bought a car, slapped on a novice cross and was almost ready to go! 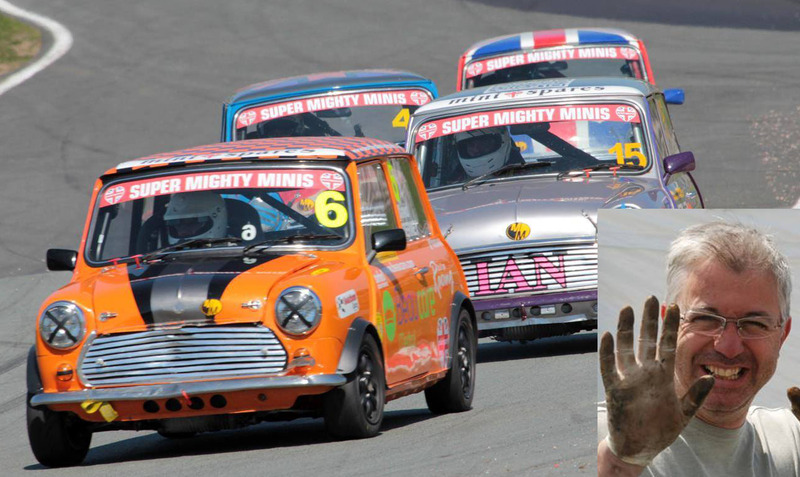 2016 will be the first time Paul has competed in any form of motorsport and he has never driven any of the tracks in the Mighty Mini championship. However he relishes the challenge and knows it will be the perfect antidote to life in the corporate world.Paul is married with three grown-up children, lives in his home town of Bristol and works mainly in London. His wife, Lisette, is always there to lend a hand and without her support he would not have managed to get started.Steve Rideout takes care of Paul’s car and Paul is very appreciative of the huge support Steve continues to give him on and off the track. 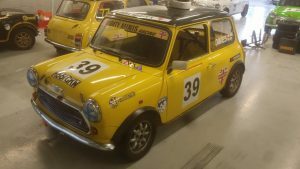 For the 2018 season, Paul has stepped across to the Super Mighty Minis championship and has handed his Mighty Mini race car over to his wife Lisette.